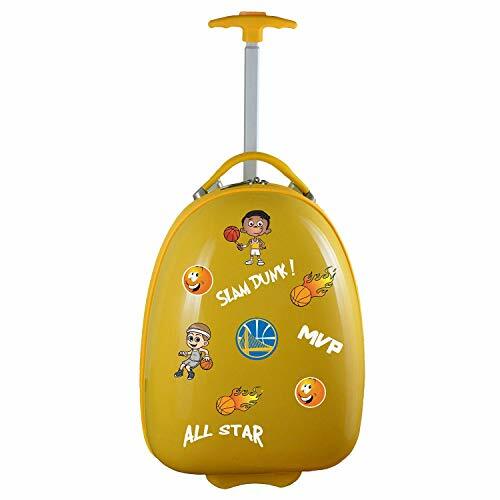 This NBA Kids Lil' Adventurer Luggage Pod made my Mojo is ideal for young explorers who love to travel and want to show off their team spirit. Each luggage pod measures 18-inches in length and boasts a dual interior compartment for convenient storage. It is embellished with an NBA team colored logo and features 100% ABS hard-shell exterior for long-lasting use. The quick release telescoping handle and in-line skate wheels ensure smoother rolling which is perfect for the little adventurers who are ready to embark on their journeys and explore the world.